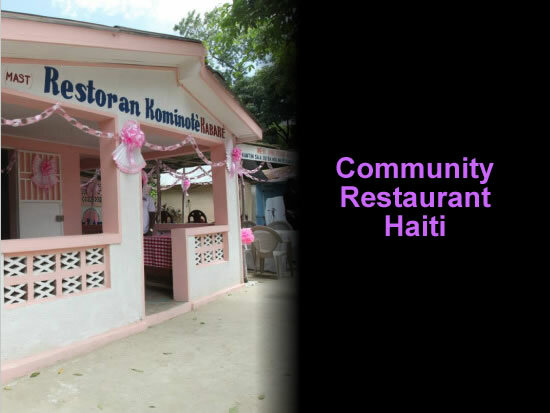 Community restaurants North of Haiti "Gouvenman an lakay ou"
Sustained on contributions of 10 gourdes, the community restaurant project, run in 11 community restaurants across the country, serves 500 hot meals between Monday and Friday at each establishment. On the occasion of the Gouvènman an lakay ou's 3rd edition, Minister of Social Affairs and Labor (MAST), Charles Jean Jacques, gave a rousing speech in which he underscored the benefit of these community restaurants to the country. As such, 7 more of these restaurants are to be opened as part of a larger development plan for the north of Haiti. These will add to the number located in places such as: Nan Banann, Morne Rouge, Plaisance, Limonade, Fort-Bourgeois, Limbé, Fourgeolle and Grande Rivière du Nord. Three of the new restaurants were opened up in Milot, Petite-Anse et à Carrefour des Père as part of the commemoration of the 210th anniversary of the Battle of Vertières. On 18th May, 2013, Jean-Jacques Charles, the Minister of Social Affairs and Labor, in presence of President Michel Martelly and his wife, First Lady Sophia Martelly and Prime Minister of Haiti, Laurent Lamothe, inaugurated Arcahaie's first community restaurant. This restaurant will be serving 500 people with hot meals every day for 5 days a week from Monday to Friday. Only a few days ago, a mobile clinic was inaugurated for treating 270 residents. This community restaurant is the 5th of the planned 90. The Martelly-Lamothe administration has set the goal of creating 90 such restaurants. All the restaurants are and will be funded by Venezuela's Petrocaribe loans.